From Patrick Street follow directions to Cork Railway Station. Hotel is on the left in one way traffic system. French Chef, Fred Deformeaux, is back in Greene’s Restaurant at Hotel Isaac's in Cork. This is great news for anyone who likes delicious rustic French style food with a twist. When I first wrote about Greene’s many years ago I couldn’t wait to go back because I had enjoyed the most delicious Savoy cabbage parcel and a delicious braised shank of lamb cooked by Fred. He was absent for a couple of years but now this terrific French chef is back waving his pots and pans. Greene’s is a terrific brasserie style restaurant with a great buzz and atmosphere and with a rather extraordinary view of a magical waterfall running down a rockface. 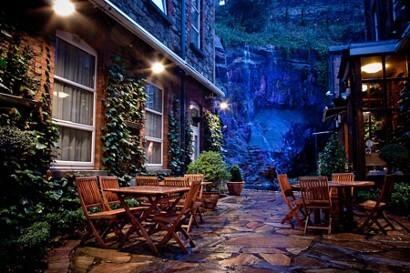 They have a great bar where you can have a cocktail or three before and after dinner, and there is an area where you can also sit out in front of the waterfall – and all of this is right in the heart of Cork City. If you are a visitor to Cork, you don’t have far to go to bed either because, although the bar and restaurant are quite separate and a dining venue in their own right, you can just go “next door” to go to bed. Starters include an East Cork Ardsallagh goat cheese bon bon on a tarte fine of caramelised red onion topped with salad leaves olive oil and balsamic dressing. Seared Blue Fin tuna served medium rare on coriander and cashew nuts, is with Basmati rice, pickled ginger and homemade salsa whilst a cassolette of lamb kidneys, smoked ham hock, wild mushrooms and red wine is topped with duchesse potato. He also does a traditional Pistou soup from Provence and a gorgeous millefeuille of sweet corn blinis, Ballycotton smoked salmon and sour cream, topped with baby asparagus salad and cucumber raita dressing – oh yes – and tempura of lemon sole served with chilli lime polenta chips and lemon mayo. Mains are equally delicious. Think of pan fried scallops on smoked ham hock, pea and potato croquette, mini vol-au-vent of garlic and herb corals with Dubarry sauce. That is top notch stuff!. Slow braised lamb neck fillet on roast garlic mash is served with caramelised baby carrots, harissa and rosemary jus, whilst slow roast pork belly is on Savoy cabbage with confit new potatoes and apple and Bulmer’s cider sauce. Other fish dishes include roast tournedos of monkfish wrapped in streaky bacon with black eye beans cassoulet of Gubbeen salami, mini Toulouse sausage and lemon beurre blanc, as well as panfried seabass on baby potatoes, asparagus and Serrano ham timbale and salsa verde. You can of course also have a steak – a delicious 12 oz rib-eye steak with garlic Portobello mushrooms, mature cheddar potato cake and Brandy pepper sauce. Desserts too are just scrumptious. Sticky date pudding has butterscotch sauce and vanilla icecream, whilst banana and chocolate spring roll has coconut icecream. The ubiquitous crème brulee is there – one of my favourite puds – but it is true to its heritage in that it is as it should be – just a simple vanilla crème brulee. There are more……go and find out. They also do a fine Irish cheese board with fresh fruit, homemade chutney, and cheese biscuits. Wines are sensibly priced with a vast selection available by the glass – one of the biggest selections in fact that I have seen. They have an excellent Early Bird menu and a great Sunday lunch menu with something for everyone. Greene’s is undoubtedly a great place to eat in Cork.